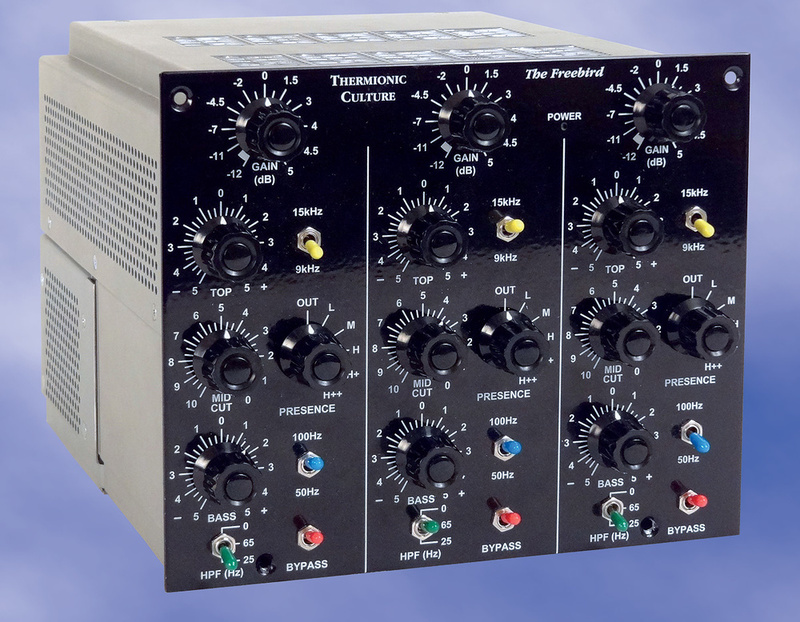 Thermionic Culture, for the uninitiated, are very interesting UK manufacturers of modern valve-based preamps, equalisers and compressors, who use techniques and concepts that are as vintage as the styling of their products. The latest addition to the fold — all of which have an ornithological basis to their names — is the Freebird. This is, rather unusually, a three-channel, five-band, valve-based equaliser constructed as a 4U-high, half rack-width unit. It can be thought of as the second instalment of a potential Thermionic Culture modular valve-console system (the first being the Nightingale, a dual mic preamp with assignable single-channel compressor). 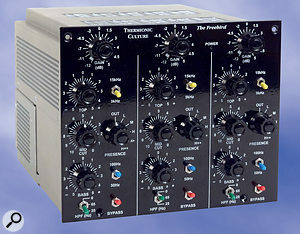 Obviously, two Freebirds could be rackmounted together to provide six independent channels of versatile EQ, but a single unit is very flexible on its own and could be used, for example, to tweak the tonality of a stereo mix bus at the same time as handling a single source channel, or to tweak a stereo input source alongside a mono input source… and so on. Three channels may be unconventional, but they must be better than just two, surely? The slightly unusual, 4U-high, free-standing format gives the Freebird an almost square front panel, with plenty of real-estate for the controls. As a result, it enjoys fairly large control knobs with lots of finger space around them, and very legible control legends and scale markings. That's such a pleasure compared with some of the overly cramped 1U products on the market! 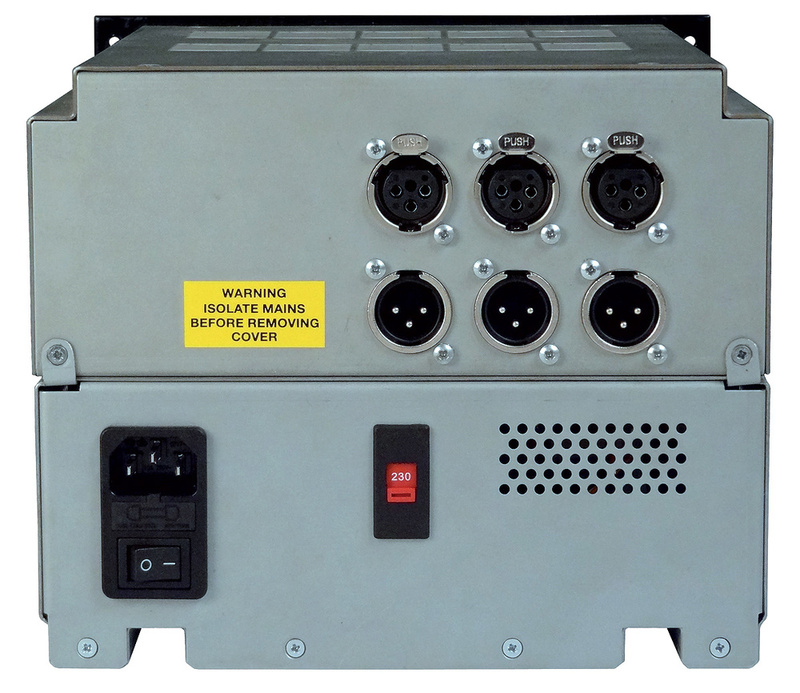 The Freebird is supplied with an integral but detachable mains power-supply unit. This sub-module bolts into the lower rear half of the EQ unit and supplies the appropriate DC voltages to the valve electronics via a hidden, self-aligning DC connector. The rear panel features a mains-voltage selector switch (115/230VAC) and an IEC inlet incorporating the on-off switch and fuseholder. It would seem reasonable to assume that, were a full console system to be introduced, a substantial central power supply unit would be employed instead, and power distributed to individual modules via these DC connectors. The upper half of the rear panel belongs to the EQ module itself and only carries three pairs of XLR connectors for the line inputs and outputs. Each channel features a Sowter transformer-balanced input, and a direct transformerless unbalanced output. This is a common theme amongst Thermionic Culture products because Vic feels they sound better this way… and who are we to argue? I haven't found any interfacing problems in this, or any other Thermionic Culture products using this arrangement. Internally, the Freebird is constructed in a very traditional way, with tag strips and lots of components wired directly onto the backs of the EQ switches and controls. The input transformers are mounted in the lower section of the main unit, while the six valves are housed on a horizontal metal plate fixed across the middle. All six valves have metal screening-cans. The mains power unit features a large torroidal transformer, mounted horizontally on the base panel. The front panel is divided into three identical channel strips, each comprising five rotary switches (from top to bottom): gain trim, high-shelf gain, variable mid-cut attenuation, presence-boost mode, and low-shelf gain. The two shelf equalisers each have two turnover frequency options selected by toggle switches, and a 12dB/octave high-pass filter with two turnover frequencies is controlled with a third toggle switch. The two high-pass filter frequencies have been chosen to sit comfortably with and complement the bass shelf equaliser. The final toggle provides a complete hard bypass facility. A miniature red LED on the front panel illuminates when the unit is powered up. The two shelf-equaliser sections are constructed from a fairly traditional Baxandall-style circuit, the high section providing a +14 and -16dB range with corners at either 9kHz or 15kHz. The low section has a slightly smaller range of ±11dB with turnover of either 50Hz or 100Hz. The mid-band, cut-only equaliser has a fixed centre frequency of 700Hz, with variable attenuation of up to 20dB — the Q also increasing (so the bell becomes narrower and sharper) with attenuation level. This equaliser section is very similar to the mid-cut equaliser found on Thermionic's Rooster dual preamp/EQ unit. To complement the fixed mid-band attenuator, the Freebird also boasts an adjustable 'Presence' boost stage, which is based on a circuit designed by Vic in 1960 — although in this version it features a more elaborate range of different mid-lift bell and shelf equalisation curves (see the AP test plots, discussed below). I've not come across anything quite like this before, and the combination of gentle three or four decibel high-shelf curves with a slight response peak at the low corner frequency and a gentle fall across the upper region makes for unique and interesting — but always musical — presence lifts. Apparently, the entire EQ circuitry has roots that can be traced back to 1961, when Vic employed similar ideas in the custom valve consoles he was building. The Freebird incarnation is a refinement of those earlier designs, with considerably more flexibility and an emphasis on versatility to suit the modern way of working. Clearly, with such potentially large amounts of boost or cut across the spectrum there is a risk of overload distortion or noise within the Freebird or in subsequent equipment, so an input gain trim facility is provided, spanning +5 to -12dB. This is also very handy for level matching the signal when comparing dry and processed signals using the bypass toggle switch, helping to avoid the 'louder is better' syndrome! For alignment nerds, an internal trimmer is provided to allow the unity-gain setting to be calibrated precisely, since it will vary to a degree with the output loading — although it is set at the factory for a 10kΩ destination impedance, and that seemed just fine for all of my auditioning and testing. Despite the presence of three-pin XLRs, the I/O of the Freebird is unbalanced, as on all Thermionic gear, because designer Vic Keary feels it sounds better. I ran the Freebird through a complete suite of Audio Precision tests to confirm the manufacturer's published specifications — as I do with all review products when possible. In this case, the results closely matched the published specs in almost every respect. You can see the test plots themselves on the SOS web site at /sos/nov11/articles/thermionicfreebirdmedia.htm. Total harmonic Distortion (THD) was around 0.02 percent for a reference +4dBu input signal, rising to 0.35 percent at +20dBu and finally giving up the ghost with 1.0 percent at +23.5dB. The predominant harmonic is, not surprisingly, second harmonic distortion which really starts to become dominant for signals above about -20dBu, with the third harmonic starting to make a strong appearance for signals around 0dBu (see plots showing distortion products for input levels of +4 and +19dBu). The signal-to-noise ratio, referred to a +20dBu output, was just over 100dB, which is extremely good, and the frequency response remains within ±0.5dB margins between 20Hz and 80kHz. However, the response isn't perfectly flat, as the (expanded scale) AP plot reveals: there is a very subtle bass bloom of about 0.75dB, which bestows a little valve warmth and colour even when the EQ controls are set flat. Gain tracking between channels for matched control positions seemed to remain within 0.25dB and was usually even better. The crosstalk between channels varies, depending on which two channels are being measured. At 10kHz, channel one scored -83dB relative to channel two, but going the other way scored only -60dB. For channels two and three, the scores were -64dB and -73dB respectively. I suspect the internal wiring layout and general construction to be the cause of these variations, but even at -60dB, the crosstalk isn't likely to cause problems in most circumstances. The shelf equaliser responses are shown in the plots on our web site that I mentioned earlier, and illustrate the alternative turnover setting responses. It's interesting to note that the HF shelf exhibits a moderate peak before cutting and dip before boosting, while the bass shelf reveals more conventional Baxandall curves. The mid-cut filter appeared to be tuned to 750Hz rather than 700Hz, and with a maximum cut of 21dB rather than 20… but I don't think it's worth quibbling about such minor component-tolerance issues! The presence-boost curves (along with the mid-cut responses for mid and full attenuation settings) are illustrated in another AP plot, and I've annotated which curves correspond to which settings. Apparently, the 'M' setting corresponds to Vic's original design, giving a very broad and relatively gentle +4dB lift centred at about 1.3kHz. Predictably enough, the 'L' setting moves the peak lower in frequency, giving about +3dB of broad boost centred on 400Hz. The three 'H' settings provide progressively more boost (I measured 2.5, 4 and 9dB) centred at about 3kHz. The high-pass filter pulls the -3dB point up from 12Hz (off) to about 35Hz or 85Hz. The published specs quote, rather unusually, the frequencies (25 and 65Hz) where the attenuation is supposed to reach -8dB. However, the accompanying test plot shows that the review sample reached -8dB at 6Hz with the HPF switched out, and 19 and 42Hz for the two filter options. I only mention this because of the disparity between measured and published specs — in practice, the HPF section does exactly what it needs to do, and does it very well! The Baxandall equaliser has become the mainstay of most outboard and console channel strips for half a century, and with good reason — it is fantastically versatile when it comes to moderate tonal shaping. The version found in the Freebird is no different, and the control ranges and turnover frequencies enable a very wide range of musically valid tonal shaping to be performed quickly and easily. The high shelf is perfect for bringing out air and sparkle, or for taming an excessively prominent or gritty high end. The low shelf can be used to bring an over-exuberant low end under control, or to warm up a thin-sounding source — with the high-pass filter to help keep the subsonics in check when the bass boost starts to reach mid-range. The fixed mid-cut section is useful for controlling sources that start to sound a bit congested and boxy, while the presence control is a truly wondrous thing! Flicking through the ranges quickly identifies the right setting: 'L' to add some body to guitars and keyboards, 'M' for giving a little more focus to most things, and the various 'H' settings to bring vocals forward, and to add some detail and clarity generally. The bottom line is that the Freebird is a very nice, well-balanced equaliser that does precisely what you think it should, with well-chosen, musically relevant options and totally intuitive controls. There is no mistaking that this is a valve-based product, and the golden-eared will no doubt recognise the subtle hint of iron from the input transformers too — but that's not to suggest that the 'valve' character is in any way heavy-handed: it isn't. This is a very classy-sounding product with modern performance specifications and some very unusual facilities, assembled together in a very unusual format, and I like that. While there are countless high-quality valve (and solid-state) equalisers on the market, I'm not aware of any equivalent three-channel products. The Freebird's Presence control is unique too, and while similar response shapes could be created with many other equalisers, none can match its immediacy or simplicity. Three channels. Well, it's one more than two, so that has to be a pro! Simple, yet hugely versatile EQ options. Excellent sound quality and character, with just the right hint of 'valve-ness'. Input gain control for bypass level matching (and overload prevention). Unbalanced outputs might (unnecessarily!) worry some users. The Freebird sticks to classic Thermionic Culture design values, and the result is a simple, yet comprehensive valve equaliser in an unusual tri-channel format. Creative tonal shaping and control is what the Freebird is all about, and it does it brilliantly.